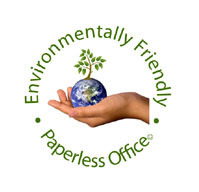 A paperless office is a work environment in which the use of paper is eliminated or (more realistically) greatly reduced. Save money (paper, printers, inks and toners)Boost productivitySave spaceMake documentation and information sharing and searching easierKeep personal information more secureAnd, of course, help the environment. We are now more environmentally aware, we see the production of paper as a significant contributor to deforestation and climate change. We have added measures like recycling and tree-free paper to help reduce the environmental impact, but online document management systems like SharePoint is seen as the strongest contributor in reducing the need for paper.